Corner Showcases configure your retail display area to maximize lost corner space. 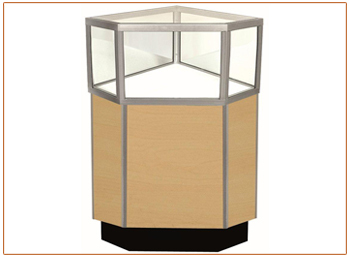 Line up corner showcases with adjoining showcases to turn a corner or create a kiosk display. Corner Cases add display area to your showcase area while at the same time creating unique configurations. Traditional Corner Showcases fit closely into the corner to increase display space. When using showcases and corners of the same series, the base and display area match the adjacent cases. Access to the corner case can be from the left, right, or both sides. Special shelving is extended from the adjoining case, requiring both cases to have open ends. Traditional Jewelry Corner Displays are compatible with Streamline Extra Vision showcases. Overall dimensions are 38” high and 20” deep. Ü Please supply drawing of case configuration to ensure accuracy.